In this blog post, we will look at a case of Windows system process CPU spike and the procedure to troubleshoot it. Determine the thread in the system process that taking up the CPU resource and Identify the driver or subsystem the thread is running for. Once you determine the source of the issue, you can formulate a fix. Depends on your situation, this could be disabling the offending component. Or if you are lucky, obtaining and applying an update from the vendor of the offending component. My colleague recently recommended a customer to make a configuration change for a software we are supporting. After the change is made, the customer noticed a CPU spike from the System process. (It’s actually not related to the configuration change, but the customer started paying attention after the change and noticed the CPU spike). The only way to make sure it’s not related to the config change is to figure out what caused the CPU spike. Mark’s blog post has a good explanation as well as some very helpful tips on how to troubleshoot System Process CPU Spike. A quick look at the Task manager confirms the problem. Using process explorer, we can look at the threads running in the system process (In process explorer, right click on system process > properties > Threads tab). 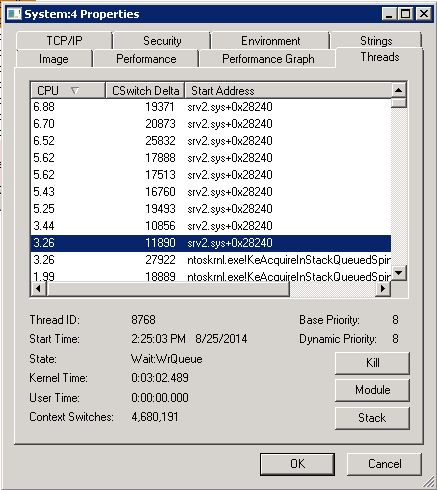 In my case, process explorer shows that there are a few threads taking up a few percents of CPU each. It also indicates the start address and it points to the srv2.sys driver. This is the Microsoft SMB 2.0 server driver. I confirm that the machine is running Windows 2008 R2. It’s a file server with at least one shared folder that has ABE enabled. And we are having CPU spike issue. The solution would be to install the hot fix in the knowledge base article.